As scary as it may be, true intelligence seems somewhat rare today. Those with a real desire to learn, expand their knowledge and push boundaries to become truly great are few and far between. Highly intelligent people often get pushed into the background in favor of those who have the ability to entertain, and many people settle when they get comfortable, instead of choosing to constantly move forward. 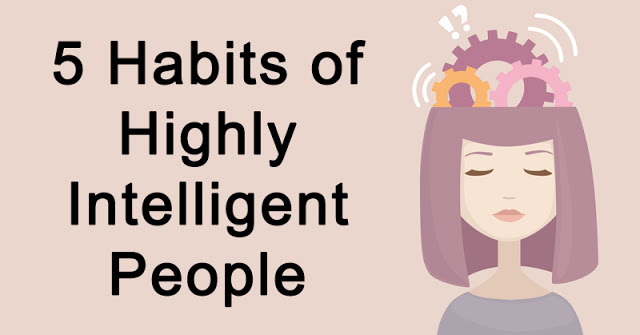 These five habits are the mark of a highly intelligent person! constantly questioning beliefs, ideas, tradition — anything they can find another side to. They apply deep critical thinking skills to form their own opinions and read between the lines. They are able to see through lies and charades to figure out what’s really going on. Highly intelligent people stick to their beliefs and they follow their own path in life, constantly on the hunt for knowledge. A highly intelligent person does not have a guru, master or an idol. They may be inspired by the work of others, but they know that by working hard, expanding their knowledge and searching for answers, they will be able to find all of the knowledge they seek on their own. They understand the value of teachers, but they see themselves as their own personal gurus, with the wisdom and strength to get them through anything. They are confident in their ability to work hard and find the answers they seek. to act on them. Half of the fun is bringing new, exciting and different ideas to light. They are constantly conjuring up plans in order to achieve their goals. They don’t just learn, they apply their knowledge whenever possible. They aren’t afraid to share their knowledge and their ideas with others. Highly intelligent people are never satisfied. They are constantly wanting to learn more, see more and do more. They not only crave knowledge — they also crave adventure. They seek to truly experience the world around them. Highly intelligent people sincerely enjoy expanding their minds and engaging in intelligent conversations with others. They have a true fascination with knowledge and they never allow themselves to be simply content. They know that knowledge is power. It may seem that highly intelligent people are constantly learning and doing, but the truth is, they know when they need downtime. They value quiet time to reflect and re-charge. They spend a lot of time alone with their thoughts placeholder 118 blocked. Reason : no sizes , quietly planning. Highly intelligent people know that it’s important to get away from the hustle and bustle every once in a while to rejuvenate mind, body and soul. They know that self-love and self-peace are key to happiness.